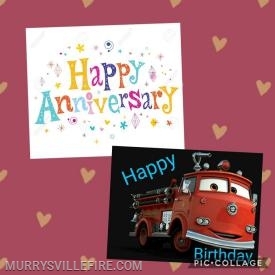 Murrysville Volunteer Fire Company is a 100% volunteer organization. Please note that we are a separate entity from Murrysville Medic One. Any inquiries regarding CPR or other medical training/education should be directed to them. Russell Cline - 42 Yrs. Alex Vallo - 12 Yrs. The intent of this site is to provide viewers with insight and images of the daily operations of the Murrysville Volunteer Fire Company. The Murrysville Volunteer Fire Company is a Participating Organization at the 75% level as defined by the Office of the State Fire Commissioner.